CCrystal Crag (10,400’) is a small yet intriguing formation that is much closer to civilization than most of the routes in this book. 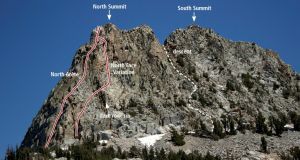 The easy access, beautiful setting in the Mammoth Lakes Basin, and the memorable climbing through a corridor of crystal on the final pitch makes it well worth doing. There can be loose rock collected on ledges which has caused accidents on Crystal Crag, so climb with care. The North Arête is an excellent first alpine route before you head out to more committing mountains, or for faster and more experienced teams, is a fun half-day cruise. Unique climbing through a hallway of slippery crystal is an experience you aren’t likely to find anywhere else. Since Crystal Crag is very ledgy and featured, there are many ways to climb it. We show the most popular routes to the top: the North Arête and the North Face Variation, both of which end in the spectacular crystal corridor. There is also some fun sport climbing along the base of Crystal Crag, so if you finish early, you can easily get some more pitches in.